At Mullinax Ford of Kissimmee, we're excited about the popularity of the Ford Fiesta, a subcompact car that offers exceptional value and personalized style options. 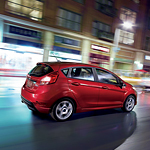 The choices start with the Fiesta's trim lines, and we know there's an option that's right for you. Opt for the entry-level S, the well-equipped SE or the sporty ST and ST-Line for even more power and verve. When you drive in a Ford Fiesta, you can also highlight your personal style choices. Choose from one of 10 different brilliant colors in exterior paint. With eye-catching options like Bohai Mint and Lightning Blue and a range of premium paints, you'll make an impression wherever you go. The color choices don't end on this car's strong, exciting exterior. Enjoy the soft materials, tech-friendly center console, ambient lighting and other interior design options in seven different color options to suit your taste.